Prisoners undertaking forced labour in an aircraft plant. The occupation of western Europe placed considerable strain on the Nazi war economy. As they occupied more countries the Nazis relied on confiscated resources, economic exploitation and the use of forced labour. Though accurate figures cannot be known, in excess of 25 million Europeans were forced to labour for the Nazis at some point during World War II. Civilians were forced to complete almost every conceivable kind of work: in mines and quarries; in construction, road maintenance and demolition; in agricultural work, industrial factories and munitions manufacturing. Forced labour was also used for dangerous war-related work, like bomb disposal or the repair of bombed bridges and infrastructure. The more fortunate were deployed in less back-breaking jobs, like domestic service, small businesses, government offices, laundries, laboratories or other places where skilled labour was needed. Forced labour was imposed on non-German civilians, Jews and prisoners-of-war, especially those of Slavic origin. While the majority of forced labour took place in Nazi-occupied countries, it was also used extensively within Germany. Several million Poles and eastern Europeans were shipped into Germany against their will. Called zivilarbeiters, these workers were not technically prisoners – but as foreigners, they were still subject to harsh restrictions. Zivilarbeiters were housed in labour camps or tenements; they were subject to curfews and restrictions on movement, prohibited from mixing with Germans and given meagre food rations. Outside Germany, civilians forced to labour by the Nazis usually lived in labour camps or ghettos. Their living conditions varied and depended on the type of work performed, the nature of Nazi occupation in their country, the availability of food supplies, the methods employed by the SS or camp authorities, and their political and racial status. The real beneficiaries of forced labour were the Nazi regime and the owners of German businesses. Wages for forced civilian labourers were set by local Nazi administrators and were much lower than those of free civilian workers (usually between 30 and 50 percent less). The opportunity to employ a workforce at significantly lower cost enticed hundreds of German companies to request forced labour during the war. The allocation of forced labour, however, was strictly controlled by the Nazi bureaucracy. Within Germany it was managed by a government department called the Arbeitseinsatz (‘Labour Conscription Office’); in the occupied territories it was decided by Gauleiters and SS administrators. As elsewhere in Nazi economics, the allocation and management of forced labour were riddled with bribery and corruption. Government officials and SS officers often received pay-offs or kickbacks for approving requests for forced labour. IG Farben. The fourth-largest company in the world and the largest outside the United States, IG Farben produced chemicals, including pharmaceuticals, dyes, photographic agents, pesticides and industrial chemicals. During the war it diversified its production, making synthetic fuels, oil and rubber. IG Farben also supplied the infamous Zyklon-B, the cyanide-based poison used in the gas chambers of Auschwitz. IG Farben was the largest employer of forced labour in Nazi Germany. It was so heavily involved in the Nazi war economy that 23 of its directors and managers were later placed on trial at Nuremberg. All were either acquitted or treated lightly, and most returned to their previous positions. Krupp. One of Germany’s oldest companies, Krupp was the nation’s largest steel and armaments manufacturer. Prior to and during the war, Krupp produced submarines, armour plate, artillery guns, tanks and munitions for the Nazi military. Krupp was an extensive employer of forced workers, who were often subject to brutal treatment in its factories. Twelve Krupp directors stood trial at Nuremberg, charged with forcing more than 100,000 people to labour in their factories, one-quarter of them prisoners-of-war. All bar one were found guilty and given prison sentences of up to 12 years. Thyssen AG. A major steel manufacturer, Thyssen AG was Krupp’s largest competitor. Its manager, Fritz Thyssen, was a keen supporter and bankroller of the Nazis until he fell out with them in 1939. Thyssen AG nevertheless supplied the war effort, aided by large amounts of forced labour. The company built and operated 17 labour camps, and a member of the Thyssen family was present when 200 Hungarian Jews were massacred at Reichnitz Castle in Austria in March 1945, allegedly for the entertainment of high-ranking Nazi guests. Thyssen also had extensive business interests, steel holdings and bank deposits within the United States, including links with Prescott Bush, an ancestor of presidents George Bush Senior and George W. Bush. Volkswagen. The prominent German automobile manufacturer was formed by the Nazis in 1937, who hoped to stimulate the economy by producing cheap ‘people’s wagons’. During the war, the company diversified into military vehicles, under the guidance of engineer Frederick Porsche. Volkswagen’s plant in northern Germany reportedly used between 15,000 and 20,000 forced labourers; around one-tenth of this number were Jewish. In 1998 the company began an $11.7 million compensation fund for Holocaust survivors. Porsche later began his own company designing tanks, though it is unclear if it utilised forced labour. Hugo Boss. Today Hugo Boss is renowned for its stylish men’s suits and flashy silk ties. During the 1930s and 1940s, however, it was one of the main uniform suppliers to the Nazis. Its namesake and founder, Hugo Boss, was an enthusiastic NSDAP member. Boss designed and supplied uniforms to the party’s paramilitary arms, such as the SA, SS and the Hitler Youth. Since Hugo Boss employed mainly on German seamstresses, and women could be hired for lower wages, he did not have the same need for forced labour. Nevertheless around 200 forced workers were used in Boss factories at various times. Siemens. A manufacturer of electrical and electronic equipment, Siemens was both a supporter and a beneficiary of the Nazi regime. The company supplied engines, electrical generators and switches to the German military. At the peak of its production, Siemens employed 244,000 workers, around 50,000 of whom had been forced to labour. In the final years of the war Siemens shifted much of its production out of major cities, in order to avoid damage from Allied air raids. 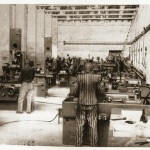 The company built and operated makeshift factories inside or near notorious concentration camps, including Auschwitz. Forced labour was not just used to meet Germany’s war needs: it was also a response to the ‘Jewish question’. German and Austrian Jews were subjected to forced labour well before the outbreak of World War II. In December 1938 a Nazi edict ordered that all Jews without jobs and reliant on welfare had to perform unskilled work, such as road construction. By mid-1939 more than 20,000 of Germany’s 167,000 Jews were involved in forced labour. The conquest of Poland in September 1939 and western Europe in mid-1940 gave Berlin rein over millions more Jews, many of whom were conscripted to work for the Reich. The treatment of Jewish forced labourers was significantly worse than that of other civilian workers. Jews were held as geschlossener arbeitseinsatz (‘locked-up labour’) in walled ghettos or labour camps. Jewish workers did not receive any payment: their ‘salary’, as little as a few Reichmarks a day, was paid by the employer to the Nazi government. By mid-1942 more than 1.5 million Jews were detained in concentration camps and around half of this number was forced to work. The attitude of Jews to forced labour could be surprisingly positive. 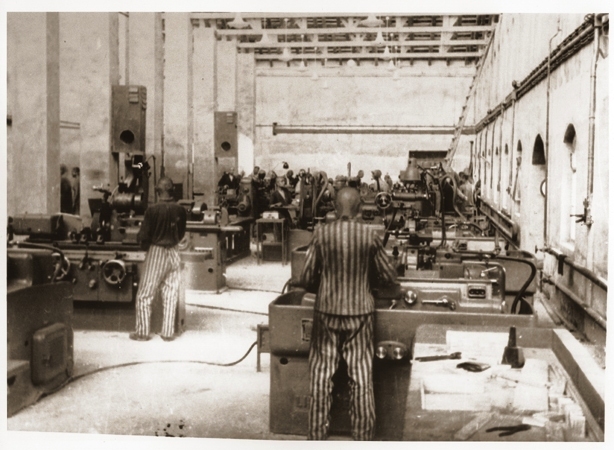 While engaged in important work like construction or munitions production, some Jewish forced labourers thought themselves a vital component of the Reich economy. The optimistic believed that nothing worse could happen while they remained essential to the Nazi war effort. But this was a false optimism. By 1942, Berlin’s Jewish policy had shifted: the Nazis had decided upon the extermination of Europe’s Jewish population. Some labour camps embraced an unofficial policy called Vernichtung durch Arbeit (‘Extermination through labour’) – in other words, Jews would be literally worked to death, then replaced with fresh arrivals. More than 800,000 Jews died from the effects of overwork, including injuries, infection, fatigue, malnutrition and disease. 1. The Nazis made use of forced labour of civilians and POWs, to support and supply their war effort. 2. Forced labourers were imported into Germany, where they lived and worked under strong restrictions. 3. The low pay rates for forced labour made it an attractive proposition for German and pro-German firms. 4. Forced labourers lived in tenements, labours camps or, in the case of Jews, ghettos and labour camps. 5. Forced labour was a key part of the regime’s anti-Jewish policies, starting in 1938 then expanding rapidly.